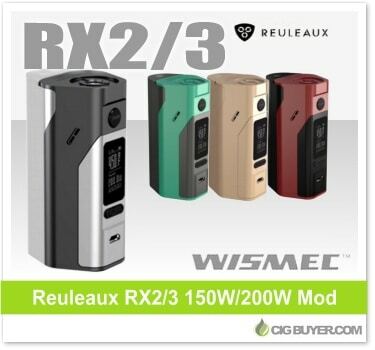 Another version of the Wismec Reuleaux is being released – the Wismec Reuleaux RX2/3 Box Mod. This version is virtually identical to the Reuleaux RX200S, with the added benefit of being able to use either two or three 18650 cells. Now you don’t have to commit to three batteries, the Reuleaux RX2/3 Mod will run with just two and provide up to 150W of output (200W with three). The device offers precision temperature control (Ni, Ti, SS) along with tons of other advanced features. It includes the same large 0.96″ OLED display as the RX200S, with magnetic battery cover, micro-USB port and spring-loaded 510.